If you could improve your business today, you would, right? As business owners, we are always looking for the next best thing — the most popular online courses to help us book more clients, the quick fix to grow our email list, how to come up 56 different blog post ideas in an hour, how to increase our organic reach on Facebook — and the list goes on. I’ve downloaded my fair share of freebies, opted in to multiple email lists of the world’s leading entrepreneurs and even hired a business coach + joined a mastermind group this year. It’s wonderful to keep an idea mind, always be willing to learn and grow and see what’s working for those who are truly successful and earning multiple six figures a year. 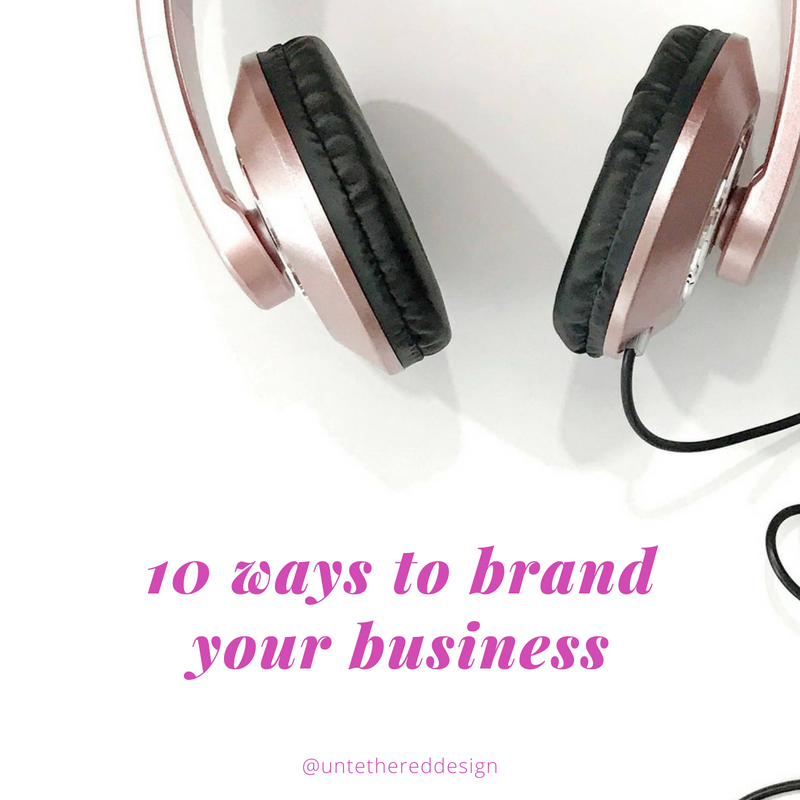 While we really know that setting ourselves (and our businesses) up for success still takes a lot of time and hard work — nothing is as easy as it seems or is advertised — I’ve got a few quick tips for you to follow today, that will most definitely improve your current branding. Can you say that you’ve done all five of the following? Ask yourself now…and you will learn a little more about your biz and what you need to keep working on. And, go! You can’t solve problems for others and know what you’re truly passionate about or good at, if you don’t truly know yourself. What do you do? What do you WANT to do? What do you want to be known for? Do you see yourself doing it for a long time? If you know the answers to these questions, then jump to #2. If you don’t, you need to figure out the answers. Realize what you really enjoy doing, if you can provide a service or sell a product around it and if it will truly benefit someone’s needs. After knowing yourself, what you do and what you want people to associate you with, ask yourself who your ideal client is. Do you appeal to fellow entrepreneurs, mid to large size businesses, corporate companies, non-profits or a different group? You can’t sell to someone if they don’t need what you offer. There has to be a specific audience that wants what you can provide, so make sure that you’re marketing to them. Find them, they need you! If you know who you are, what you enjoy doing and can sell what someone needs directly to them, you can have a very successful business. But, in order to look professional, you have to play the part. If you don’t have a strong logo, website, social media graphics, marketing materials and messaging in place, you will not be taken seriously by your clients. The more consistent you are with all of the aspects of your branding matching and flowing together cohesively — and your content being delivered in a complementary way with the branding — the better the chances are of you looking more sophisticated and legitimate. Your branding is a reflection of your personality, your style and how you serve your clients. If your visuals connect with your words and they communicate well together, your brand will be expressed more effectively and resonate better with your clients. Along with ensuring that your branding is professionally in place, it’s up to you to always show up. Show up for your brand, your client and the work that needs done. At the end of the day, as an entrepreneur, you have to hold yourself accountable. 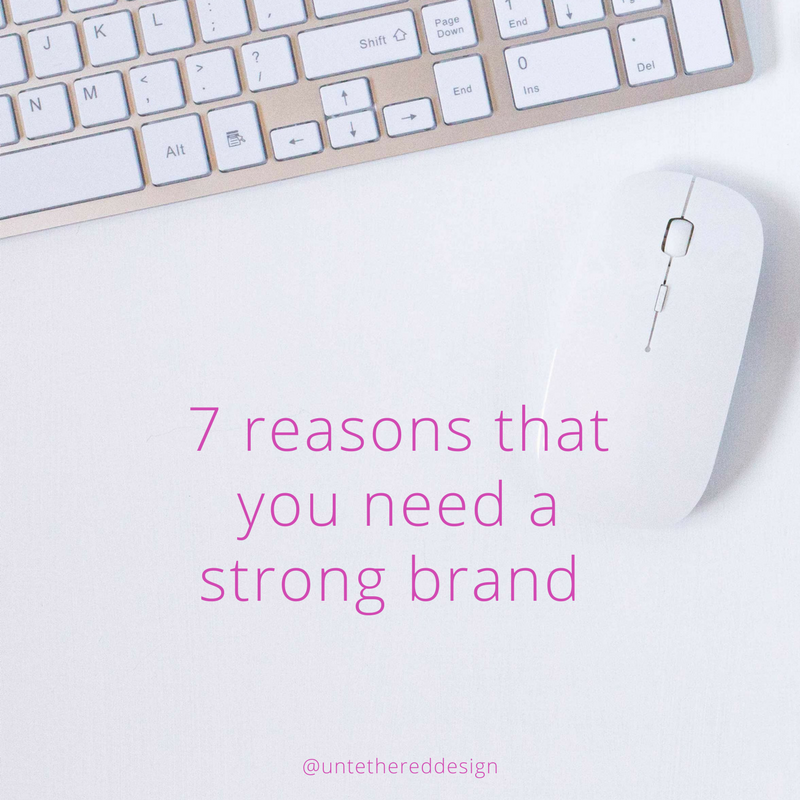 The harder you work at making sure that your branding is strong, the client work gets done and your business development is taken care of each week — the more consistent your business will be. And, consistency is KEY. Without it, as mentioned above, you won’t be taken seriously. Work hard every single day. It WILL pay off. Since I just mentioned working hard and holding yourself accountable, an important thing to realize when running a business is also knowing what you’re good at and what you’re not — plain and simple. As a business owner, you will often start off running around, doing everything. I’m a graphic designer. I enjoy designing, writing and client + project management. I don’t love basic admin tasks like email management, posting blog and social media graphics or accounting. So, I’m going to spend my time and energy on being productive with what I love to do and am good at and I’m going to delegate the other work to someone else. It’s better to put your focus on positive energy and hire professionals to do the “other” work that you don’t have time for or like to do. There is nothing wrong with that! Do you ever struggle with choosing just the right combination of colors for your brand, a client’s brand or an individual design project? There are literally countless colors that exist, in different shades and tints. Even just increasing the darkness or lightness of a particular color can change how it looks within a design, entirely. How many should you even use? 2? 6? How do you piece together what works and what doesn’t? What do certain colors mean? There is a ton of psychology involved with colors — and they alone play a huge role in your branding or any design project — because a palette is one of the aspects that someone remembers the most. It hits on certain heartstrings, can alter a mood and evoke a specific emotion, like happiness or anger. It can really set the overall tone for a design — like a logo, a website or a poster. Today, I want to break down how to even begin in general when it comes to pairing a collection of colors together, to create a palette that looks really professional, attractive and timeless. It’s important to note that I’ve even seen lovely and successful brands that just use black and white. The secret is in simplicity, using colors that are visually-pleasing and therefore, memorable — along with considering emotions associated with individual colors. Decide on 2-4 colors — It’s easy to get very overwhelmed when looking at all of the different colors that the world offers us. If you’re just starting out, stick with planning to choose a minimum of 2 or a maximum of 4 colors. For example, I’m sure that Target uses other colors within their official brand standards, but I (as a consumer) only think of two specific ones — red and white. And remember, you can always add more to your palette later, or if it’s for a brand, you can create a secondary palette that can be used in special circumstances. Extra pops of accent colors can always enhance a brand. Consider your audience — Different people may feel differently about certain colors, but overall, there is a general science behind most colors. Keep in mind who you are communicating to or trying to reach. If it’s an entirely male-dominated demographic, you might not want to use pink and purple, as they tend to give off more of a “feminine” vibe, but you might try using a mix of blues, greens and greys. If your audience is something related to children (like a school program) you could play with colors that are more youthful and exude a fun, bright and youthful flair. If your audience is professionals in the wedding industry or brides, you could consider colors that are softer or more pastel-based — over ones that are bolder and harsher. These are just general tips to follow — of course, men can like pink and some brides use darker and moodier colors for their weddings. To each their own! Red: excitement, anger, energy, heat, loud, meant to grab attention. Blue: corporate, professional, cool, peaceful, serenity, calmness. Green: health, fresh, nature, environmental, growth. Purple: bold, unique, royal, power. Orange: similar to red, but on less of an “alert” or “anger” scale. More bright, fun, hopeful and positive. Yellow: similar to orange. Youthful, happy, positive, cheerful. 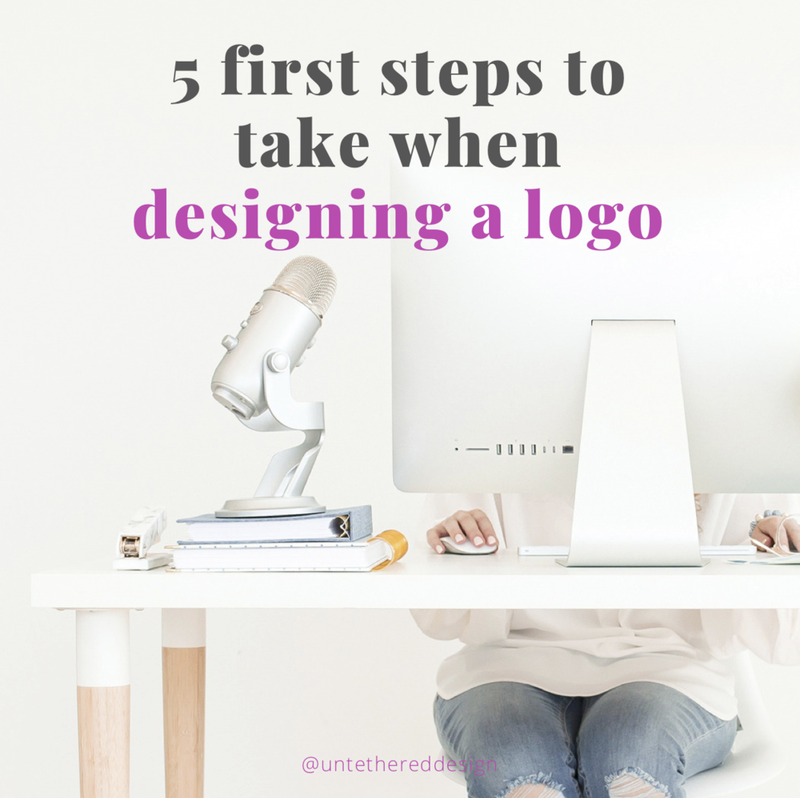 You might be a designer who is finally ready to create their own logo and official “face” of their brand — that they haven’t had time to craft because they’ve been so busy designing logos and brand assets for others. Or, you might be an entrepreneur who has not perfected a polished and professional visual brand just yet, but knows that you need to. If you have the funds, I highly suggest hiring a design pro to work with, as you’ll have a high-quality product at the end of a fun process and you’ll (hopefully) establish a good relationship with a go-to creative that can be a longer-term member of your team. Or, perhaps you’re not quite ready to invest in a designer just yet, but you want to try your hand at DIY-ing it. Regardless of your situation, congrats for recognizing and realizing the importance of a logo and eventually, the rest of a cohesive and consistent visual brand! If you have your overall vision and strategy in place (you know who you want to serve, where to do that and how) and you know the voice and tone that you want to speak in (and what you want to say), beginning on your visual brand is a great next step to take. To start that process, nail down the logo first! Create a mood board. You can do this digitally via Pinterest or with images that you find on Google or you could even go the old-fashioned route and piece one together using magazines and paint chips. Browse photos, colors, typefaces, quotes, patterns, textures and more. Establish the overall aesthetic, style and vibes that you want your logo (and brand) to visually express. Light? Moody? Feminine? Simple? Colorful? Chic? You decide! Decide what platform you’re using to design the logo — and weigh the pros and cons. Are you going to experiment with a free trial or monthly subscription purchase of Adobe Creative Cloud, the industry standard of professional design applications and specifically, Adobe Illustrator, the program that is intended for any illustration-based work for web and print platforms. If not, there are obvious design limitations that you’ll find in a program like Canva, but it can still work as a great design resource, especially when you’re just starting out. Decide on the imagery style that you’ll build your logo around — are you using just type (on a single line or maybe stacked), an icon, illustration, specific lines or shapes? What about the integration of patterns and textures to add an extra dimension to your design? Just remember to keep the overall logo design as simple as possible. This way, whether it’s sized big or small, seen on a billboard, in the footer of a website or even on the back of a jacket, it’s clear and visible to read and understand up-close or from a distance. Too many details will complicate it. Sketch 6-8 concepts — then narrow those down to 4 and then 2. Revise and tweak as necessary. I always suggest testing the designs in color and also in black and white. Think about how it will translate to different mediums — online, offline, on paper, on screen or even on t-shirts or hats. Choose the right colors and fonts that will attract your potential clients or buyers. Sometimes this aspect can come before you begin the actual concepts, using inspiration from your mood board, but it’s often and flushed out more effectively once you’ve created a few concepts — and you can see what you like or don’t and what works and what doesn’t. Save the logo using the proper file formats. Once you have your final logo design refined and ready to go, save it in the proper file formats and resolutions for print and digital applications. Most importantly, the logo needs to be vector-based to begin with and if you design it using Illustrator, for example, it’s naturally setup that way. Vector simply means that the design will be scalable to any size and won’t lose its quality or resolution. A popular vector file format is an EPS. Then, save the logo as a JPEG, transparent PNG and PDF, for other various future uses. Save the JPEG in CMYK and RGB color modes. CMYK is necessary for 4-color printing (if you get business cards or brochures done) and RGB is needed for web applications — like websites and social media graphics. You can take it a step further and also specifically save it as 72 DPI for web and 300 DPI for print. For more on these specific file formats and what/when/where/why you need to use each one, check out this blog post! Think of your brand as a personality — and the visuals that you use in your everyday designs express that personality. Like attracts like and the class and quality that your brand exudes (consistently) will in return, attract the same quality overtime in potential clients and buyers. It’s important to remember that your brand is also a blend of who you are, with what you do. Not that you can’t be a totally different person outside of your business and have other interests (I do!) but I probably wouldn’t pay a designer with a dark and grungy website to design the branding needed for a light and airy lifestyle portrait photographer. Not that they couldn’t or wouldn’t have the skills, I would just most likely file that design contact away for a heavy metal band in the future and find a different designer who has a portfolio showcasing other airy lifestyle designs for the photographer’s brand. Long story short, your overall brand aesthetic should be reflective of the style of brands that you want to work with. You want a visitor to come to your site looking exactly for what you offer — and how you offer it. They should land on your site and within a couple of minutes know that they at least want to schedule a call with you to chat more, because you look like you could be a good fit for their design needs. The reason that they feel called to possibly want to work with you? They simply like what they see! The types of photos, typefaces and colors that you use all work together within your brand to attract a certain type of person. So, make sure that it is attracting the specific niche market or demographic or industry that you’re wanting to serve and connect with, or those who are aligned with your values and need what you have to offer. Brand photography or carefully-selected stock imagery — while “content is king” and copywriting absolutely plays a huge role in converting visitors to your site into potential clients (words matter!) — most people won’t even take the time to read anything without the support of visuals. Be picky with the photos that you place on your website and share on social media. I highly suggest hiring a photographer to capture some great working, candid and unique photos of you in your element or workspace (or somewhere) so that no one else will have your photos and they will truly be authentic. But if you can’t invest in a photo session just yet, try to pay a monthly or yearly subscription to stock photo websites that are operated by creative entrepreneurs. You can use platforms like iStock or Shutterstock, but there are more and more styled stock photo sites popping up everyday and you can locate images that carry your brand colors or the overall vibe and aesthetic that you want your brand to express. I have brand photos and plan to invest in an updated session later this year, but even for “everyday” social media graphics, I pay for and download photos from a couple of sites like these. Font pairings — typefaces also play a role in crafting the right design aesthetic for your website, social media graphics, business cards and more. Typography is an artform by itself. The strategic pairing of a specific font for headlines and a secondary font for subheads, along with other fonts used in body copy, pull quotes, etc. can definitely set a certain tone, all working together. Decide if you want to play with classic serif typefaces or minimal and modern sans serif options. I recommend using a combination of both, along with a fun handwritten typeface for an “extra splash” from time to time, used in special graphics or for calling out important details. For tips on finding fonts (because there are rules around the specific uses and licensure of personal + commercial versions) check out this blog post. A striking or unique color palette — similarly to choosing fonts, picking the right mix of colors for your official brand palette is a big deal! But, it doesn’t need to be hard or super time-consuming. You can include anywhere from 2-3 colors, or even go up to 8. I always say that as long as the colors complement one another, express your brand and work well together, there aren’t any other strict rules. You can play with fun online resources like Coolers or Colormind to help you generate a palette or check out this blog post. As I once stated in a past blog post, try to consider the demographics of your potential customer or client base. Are they young adults, baby boomers or older? Are they primarily male or female? What are their interests? Where do they live? What do they need from you and what you’re selling? A group of 35-55 year old corporate males who live in suits and ties every day might enjoy a more professional and colder palette that includes blues and greys because it looks sleek and sophisticated. But, 25-35 year old mommy bloggers might appreciate something a bit warmer, inviting and cozy, like pastel pinks, oranges, ivories and tans. An extra note: blend in more of you on your website, in your Instagram feed, on video and more! Be real and authentic. Show people who you really are, as not only a business owner or designer, but also as a person — online and offline. When you do, you’ll attract people similar to you (like attracts like!) and potential clients will follow and get to know + like you enough in time, to want to buy from you. Branding goes beyond your logo, your photos, your visuals — it really is a big emotional experience for your client. So, make it an attractive and unique one that is always memorable! As you approach the end of another year in business, it’s always beneficial to reflect on (as most business owners do) the last 12 months — and to evaluate the ups and downs, what worked, what didn’t, where you reached or exceeded your expectations or goals, where you perhaps fell short — and you set the goals and create the game plan for the new year, to get you one step closer to where you ultimately want your business to be. Often, within the growing and scaling of a business, there are so many moving parts and tasks to complete. Some business owners hire strategists, copywriters and designers to help launch their visual brand professionally right off the bat, so that they can be taken seriously, look as legitimate as possible and attract the right niche/client base — and focus on the other areas of their business that they’re good at, like business development and client service. Others DIY their visuals for a while, until they have the money saved up to make the investment in professional branding — because they do realize the importance of it. And, some have had very successful businesses that they have grown without any professional branding, until they hit a wall and realize that in order to grow and scale their businesses even more in the right direction, it’s time to level up and make the leap to working with a designer or team of other professionals. Regardless of which business owner that you are, you most likely have some kind of branding in place, that has gotten you to a certain point. With that, the new year is the PERFECT time to enhance and tweak that brand, so that it’s fresh and ready to take your business to the next level for the next 12 months. The good news is that you don’t always have to pay for a complete rebrand or overhaul — unless it’s absolutely needed. But, if you really like your brand or at least several aspects of it — and your clients are already familiar with it visually (because of how consistently you show up on various platforms, in the same ways, everyday) never fear! You don’t have to totally change things up or become unrecognizable. 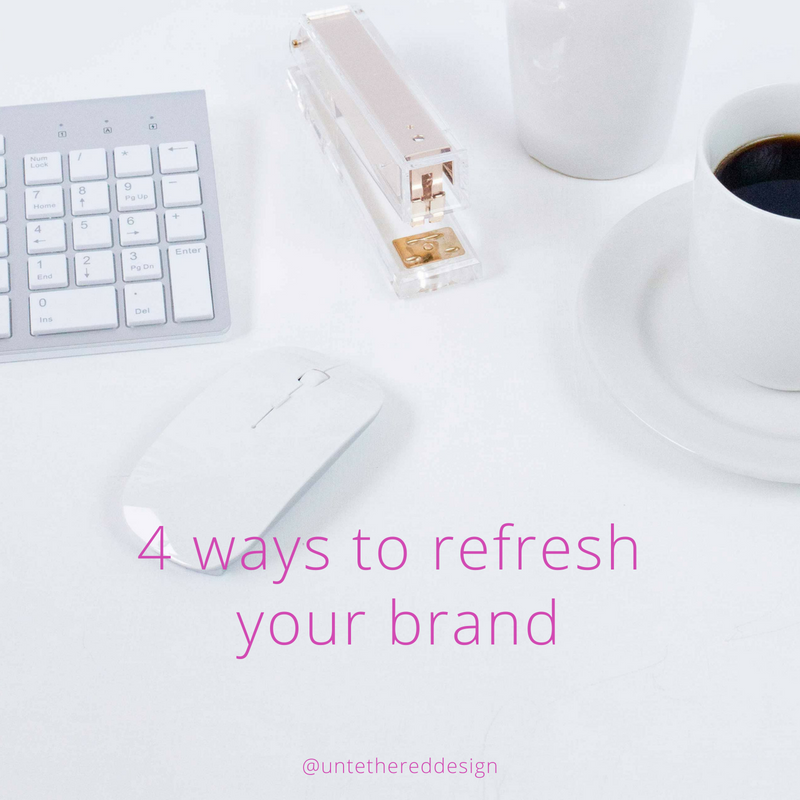 Below are a few ideas for quickly and simply adding to and enhancing your current brand, so that it stays polished, sophisticated, unique and relatable in the new year — without the price tag of an entire brand overhaul. 1. Create a secondary logo mark. If you still love your logo, you can absolutely keep using it as your primary version. But, you can also create a supporting graphic to be used when you need a smaller, more “iconic” or monogram-style of your identity. This mark can be used on certain materials, for certain times and places — and adds a fresh, new face to your brand. 2. Add a new color or texture to your palette. Again, remember that you can add to or create small extensions of your brand without changing it all up. Take your color palette for example. If you like it, you can keep what you have, but just add an extra color or two (or) replace a couple that you don’t love so much (or haven’t felt as strongly about as the others.) You can also always add a fun texture to your collection (imagine something like a gold foil, marble or metallic swatch) that adds some flair to your visuals. 3. Introduce a new font to your typography. This point is similar to the one above. Hopefully you have a classic serif and modern sans serif combination already in place that you implement. If you still love them and use them for all of your branded materials, then introduce a fun script or handwritten style font to sprinkle throughout certain designs from time to time, to highlight special pieces of copy that need to “pop.” Or, replace the serif or sans serif that you might have gotten tired of using the last few years with new ones. Maybe introduce a new font to only use on unique or separate designs, like in emails, or for a specific launch, course, podcast or other product. A new launch is actually the perfect time to use some new colors, imagery and typefaces that still complement your “regular/everyday” branding — but allow your followers to know that these visual bits are for a different platform within your brand. You can still stay on-brand and look familiar to your clients, even with the addition of a new font. It just helps to freshen things up a bit. 4. Create a collection of new icons or assets. Many brands use a collection of illustration-based icons to represent the services or products on their website or are used within social media graphics. Many also use patterns or textures (mentioned above) like watercolors or metallics. If you don’t already, then get some created! Or, if you do use them, like with adding fonts and colors, create some new ones or replace current ones that you don’t love anymore. Elements of design like this are just as important in visually supporting your brand as the right typography, color swatches and other imagery, like photos. 5. Schedule a new photography session. You might have had brand photos taken a few years ago and although they have been great and more than served a purpose, appearing throughout your website and countless graphics, it is probably time for some new ones! Looks change and we grow with our businesses, so therefore, we are always evolving. It’s important that the photos that we use on a regular basis are aligned with who we truly are, as well. Plus, who doesn’t love getting their edited photos back from an amazing session? New photos alone can make your website and other visuals looks totally new — which is just, fun! 6. Update the design of your site. This doesn’t need to be a major overhaul and it doesn’t even have to involve any code! (Whew!) Sometimes, just moving around some content, adding some new testimonials, replacing a few photos, adding a new opt-in or contact form and making small, stylistic edits will change the look and feel of the site altogether — making it look and feel new. This will only attract more of the right visitors to your site and make your brand look confident, sleek and professional. 7. Update your email template. If you send a newsletter to your subscribers, very similarly to the website suggestions above, simply update the design and layout of your weekly or monthly emails. Change up the header, the style of the headlines, update any necessary information in the footer or just change what content that you already include. Add in a few of those new colors, fonts or icons that you’ve created. If you don’t already have one, add a bio at the bottom (with one of those new brand photos... wink, wink!) and introduce yourself to new subscribers or remind current subscribers who you are and why you’re grateful to be in their inboxes. Once again, a few simple changes can go a long way! I have personally done several of these and plan to revisit others in the new year. 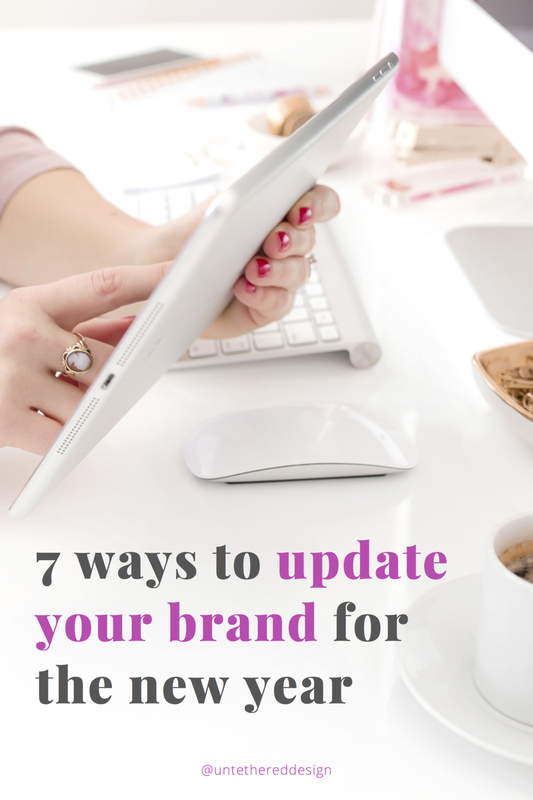 You’ll find that it’s fun to quickly update all of these various aspects of your brand, so that it looks like you’ve gone through a facelift, when really, you’ve simply changed the way that you did your makeup. New year, fresh brand! When it comes to building a new business from the ground up (or rebranding an existing one) it’s important to know that if there is no proper branding in place, the business will not be nearly as successful or leveraged as it could be. Professional branding allows a business to be known for certain skills, services or products, to stand out, to be memorable, to be valued — and to be able to stick around for a long time. 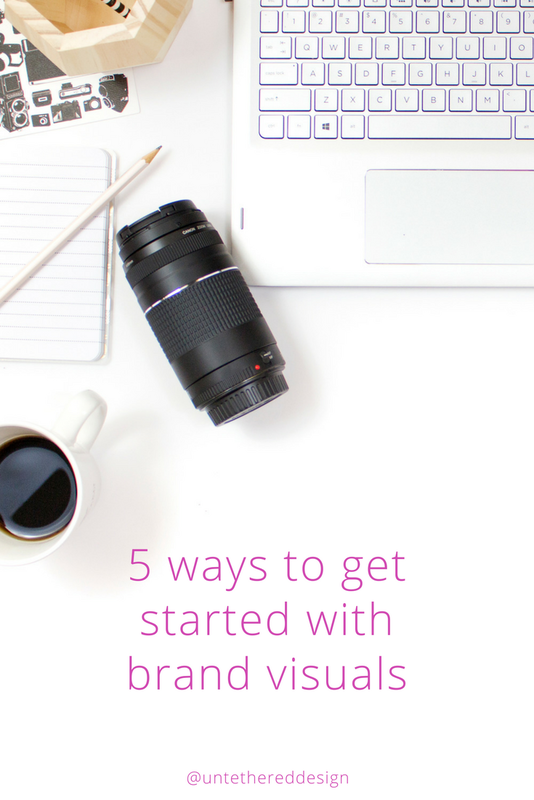 Creating the brand for your business can be done in multiple ways — both visually and non-visually — and below, I’m breaking down 10 simple and quick things that you can work on now, to accomplish this. 1. Figure out who you are and what you want to do and be known for. Before you do ANYTHING, you must establish who you are as a business owner — what you want to be an expert at, the things that you want to be known for and how you plan to stand out in a saturated market. Why should someone hire you? What do you want prospective clients to think when your business comes to mind? How do you plan to blend who you are with what you do? 2. Decide on your values. Once you figure out who you are and the purpose that you want your business to serve, make a list of your core values. What will your business stand for? What ethics will you incorporate into what you do every single day? Very often, a client is more likely to hire you if they feel that their own values are aligned with yours. Get your business grounded and clear on the emotional impact that you want to deliver through your work, to your clients, to your communities — and beyond. 3. Write a mission statement. Now that you’re clear on your business’s values, literally write out a mission statement, mentioning them. This can be simple — even just one sentence that breaks down (in seconds) the services that you provide or products that you offer, the goals and focuses of your business and the value that you will offer to your clients. A mission statement is important because it’s a specific declaration that will resonate with your prospective clients — and it’s also important for you and any members of your team to keep in mind as you work every single day. Always remember not only what you do, but why you do it — and for whom. Establish the words that you want to consistently use and the sound and tone that you want to have, whether you are writing or speaking. The voice used in your messaging on your website should match up with what you say on video or how you talk to a client. The more consistent that you are with this, the more that someone will view you as an expert. 5. Create your messaging and craft content for your blog and social media. Now that you know the words that you want to use and the tone that you want to have, put ‘em to work! You might be DIY-ing your copywriting or hiring a professional, but either way, hammer out what you want to say on your website, in your blog, on your social media platforms, in emails, on video, during a consult — and more. Touch on your client’s pain points — show them the emotional value that you can offer, no matter what kind of service you provide. Let them know that you have what they need and you can solve their problems. Make sure that what they read on your website is the same thing that they’ll see on social media or during a meeting with you. Sound like the professional that you are! Now that some of the important non-tangible items are crossed off the list, let’s move onto the “pretty” stuff! Similar to copywriting, make plans to either DIY this part or work with a designer. Before the actual design of the logo, though, make sure that you create a moodboard, decide on fonts and a color palette, get some brand photos taken care of and figure out the overall style and vibes of your visual identity. The right colors and imagery, tied in with your copy, will attract the right clients. Figure out if you want a type-based logo, one that incorporates an icon or some kind of imagery, a monogram, etc. The simpler, the better! Just make it memorable and easily translatable across different mediums on-screen and off. Once the logo is designed, move onto the website phase! Make sure that it matches up visually with your moodboard and logo — use the same colors and fonts. You can easily customize templates through platforms like Wix and Squarespace (my preferred choice) or develop one using Wordpress. Even if you just put up a landing page temporarily or a simple site with just a few, necessary pages — that is fine. Just make sure that it’s clearly stated what you do and offer — and how you can help your prospective clients. Have a strong balance of visuals + text. List your services and products, link to social media platforms and have calls to action in multiple places. Make it easy for someone to contact you. It’s important to have a Facebook page, too, but your website is still crucial because it’s literally the online home of your business — you own it and control it. Social media channels can come and go (and with them, your followers) but your domain is yours, along with your blog and email subscribers. 8. Brand the proper social media platforms. Once you have figured out where you’re hanging out online (AKA where your clients do) — whether it’s Facebook, Instagram, Twitter, LinkedIn, etc., make sure to brand those pages. Create and upload cover and profile photos, backgrounds and use your brand colors as much as possible — those are just a few quick and easy ways to stay consistent with your visual branding. Again, this way, when someone leaves your website and goes to your Facebook page, they will know that it’s still your business that they’re experiencing online. 9. Create templates to be used for print + digital mediums. Now that you have the bigger components of your visual brand established — your logo, website and social media channels — design some templates that you can start using on a regular basis! If you don’t have access to Adobe Photoshop, InDesign or Illustrator, that’s OK. Use apps like Canva that already come with pre-made and ready-sized templates for all online platforms. Think of your everyday post graphics, possible Facebook ads, blog imagery, Pinterest pins and emails — which are all digital designs. Also consider print templates that you can use for your business cards, brochures, product tags, thank you cards, client questionnaires, fliers, letterheads and any kind of document imaginable. Make sure that your brand assets are on every piece of collateral that you put out into the world. As I’ve been touching on throughout the last few points, you must be consistent! This means showing up in the same ways, every single day, when it comes to your voice and tone, the words that you say and write, the values that you stand for, the services or products that you offer, the ways that you work with your clients, the content that you put out and your visual designs. Someone should experience you in the same ways online and offline. Whether someone is talking to you in person, visiting your website, reading your blog, looking at a social media graphic or holding your business card in their hand, they should always know that it’s you. The more consistent that you show up in every way, the more professional and legitimate that you will look — and therefore, the more seriously that you will be taken. Your prospective clients will turn to you because you will be positioned as an expert! Some brands are great at jokes on social media, while some are known for responding to every comment. You’re probably better off avoiding too much humor unless you have a hilarious digital marketer on your team who always has tasteful puns on hand, but whatever tone you go for, stay consistent. Additionally, choose which social media networks you want to use. Pinterest, for example, is particularly popular among female users, Facebook will allow you to reach all kinds of people across a large range of ages and Instagram provides the opportunity to create a gorgeous visual portfolio for your business. Choose how often you post updates, deals, products news, or competitions on social media and be consistent with this frequency. Whether you post three times a day or twice a week is up to you, but your followers will appreciate consistency; having your posts appear as expected will help them to feel like they know your brand well. At first, it can be challenging to determine how often to post. Remember that while you don’t want to overwhelm your followers, small, juicy reminders of the existence of your company never hurt. Even just a quick post commenting on the weather in your city or a well-framed image of someone wearing or using one of your products ‘out in the wild’ will do the trick! At some point, you will receive comments you don’t agree with and you may get complaints that you will need to put right. You don’t always have to respond to comments on your social media accounts, but when you do, ensure you’re always gracious and professional. Sometimes, comments can be downright malicious. You don’t necessarily need to reply to these types of comments – the person making them might simply be looking for attention – but ensure you don’t lose your temper and respond in a way that’ll reflect badly on your company and discourage future customers or clients from working with you. It sounds obvious, but it’s amazing how many brands consistently make typos in their posts. If your customers can’t trust you to proofread your posts, how can they trust that your products or services will be of an acceptable standard? This is extra important if you’re maintaining a website – people will be deliberately viewing your site to find out about your company, so don’t give them the impression that you aren’t even capable of checking your grammar and spelling. Download an app such as Ulysses or Grammarly to help check your spelling and sentence structure while you type and offer suggestions. If you’re in a position to give away some free products, holding a competition once in a while is a great way to excite your customer base and show the generous spirit of your brand. Well-planned, fair ‘draw’ style giveaways are incredibly easy to set up, will give people a good impression of your brand and encourage them to interact with it. Be smart about giveaways: you might like to tell your followers that to enter, they must share one of your advertisements or tag a friend they’d like to share the prize with. This way, the cost of any product you give away will be accounted for by the advertising the competition gives you. Once you’ve established your social media handles, advertise them! Put them on your business cards and on your product packaging. Building a brand on social media will take time and patience, but it’ll be worth it if you can market to your target audience. Start planning your company’s branding and enjoy the reach that only social media can give you! Cloe Matheson is a freelance writer from Dunedin, New Zealand. She loves discussing events and has previously produced articles for sites such as Auckland Conventions. To see more of Cloe’s work, visit her Tumblr page. Do you need help with branding and design for your business? Download my Brand Launch Checklist and Branding 101 guides for free today — and join my email list, where you will continue to receive weekly tips from yours truly! 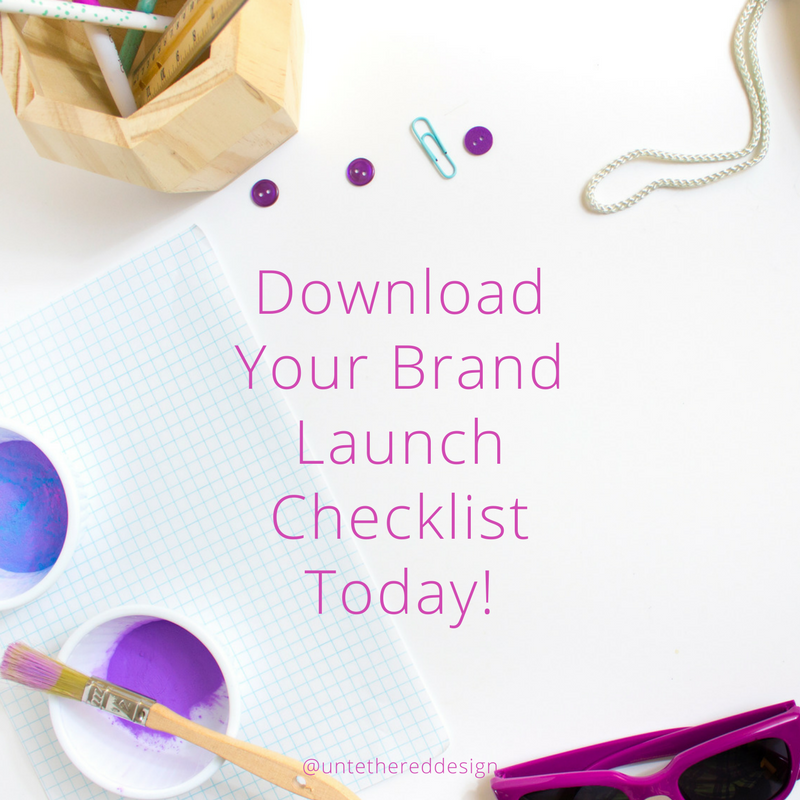 Download Your Brand Launch Checklist today! Whether you are getting ready to launch your new business or you’ve rebranded an existing one, it’s crucial to have at least a few, specific bases covered — before you put it all out into the wild! Download this Brand Launch Checklist, review the items — and make sure that you can answer each one simply + quickly. Overall, think about who you are, what you do, who you want to serve, what you want to be known for, the value that you offer and how you want your clients to feel when they experience you. Print off the checklist, answer each question and then either hang it by your workspace or keep it close by so that you can use it as a handy resource — whenever you are needing some brand clarity. • Think about your mission statement and the values that are important to you — personally and professionally. • How do you want to "sound" when you're communicating? What are the words that you will use either via video, website copy or when you write emails, etc.? • What keywords come to mind when you think of the look and feel of your brand? And how you want others to perceive it? • Do you want to serve a specific niche? Who would you love to work with? • How often do you want to work and where? Where will you operate your business? • Do you want to sell services or products (or both?) How do you want to handle pricing? • Are you DIY-ing the visuals or hiring a professional designer? You will need a logo, font and color palettes, website domain + hosting + design, social media graphics, photography and other assets to use throughout your branding for consistency and cohesiveness. • What social media platforms will you be hanging out on? Where do your ideal clients hang out? It's 2018! How is your branding looking for the new year? Do you have a logo, website and more that you absolutely love…or…not so much? If you’re not a design professional, branding might be something that you don’t love to do for your business or you simply don’t have time for, so let someone else take over! Sign-up below to receive the link to download my new and free PDF tool “Branding 101: What it is, what it isn’t and why you need it” — right now! This quick and simple guide will walk you through why it’s important to establish consistent and memorable branding within your biz — and if you can DIY some of it or if you should hire that professional. If you have any questions after going through it, let’s connect and chat some more! If you're just starting out as a small business owner, or you've been at the game for a while but haven't established a professional presence just yet — BUT — you also know your biz inside and out, what you want to be known for, who you want to serve, where you want to be seen, your overall vision, mission and strategy, this blog post is for you! As I've mentioned before, it's EXTREMELY important to have those above non-tangible pieces in place and be really clear about your brand, before you even think about the visuals. Because, a brand is the emotional experience that your client has when they come into contact with you. It's what THEY think and feel. 1) Create a mood or "inspiration" board. This can be a physical or digital collage of colors, patterns, textures and photos that evoke a specific sense of style, emotion and personality when someone experiences your brand. This is important because it sets the tone for the rest of your branding and helps you get really clear on design aspects. You can cut out images from magazines and put it together yourself or create one in Canva or Photoshop. 2) Use Pinterest to not only help you create your above mood board, but to also help inspire your color palette and logo possibilities. Create specific boards for colors, logos, typography and more to help yourself stay organized — and to give you good visuals to constantly reference. 3) Think about what style of logo that you would like to create — you can create something that is simple and type-based, or you can incorporate certain iconic, illustrative or design elements that express what your business does. Take a basic Adobe Illustrator course and download a trial version of it, if you're feeling brave enough to create it using a professional program. To make things a little easier, you can always use Canva. 4) Once your logo is finished, try your hand at using Squarespace to design a simple website. There are other platforms like Wix and Weebly, but I've always been a Squarespace girl myself. It's pretty intuitive and user-friendly. You can connect to an existing domain (in GoDaddy, etc.) or purchase one through Squarespace and it's even free for the first year. It's crucial to have an online home for your business, separate from social media platforms, in case Facebook decides to pull the plug one day — and your page and all of its followers go with it. Your website is something that you own and will be online, even if other social channels come and go over the years. Make sure that it's easy to navigate and visitors can quickly learn about what your business offers and the value that you can provide THEM with. Make it visually interesting and attractive, packed with good content, so that they will want to stay and not quickly exit the browser window. 5) For other print and digital materials, like social media graphics, business cards, brochures, PDFs and more — you can download trial versions of specific Adobe Creative Cloud programs like the trio that I use (InDesign, Photoshop and Illustrator) or use the free version of Canva. Strive hard to keep all of your branded materials consistent and cohesive. Whether someone is following you on social media, reading a blog post on your website, browsing a free worksheet or checklist from your opt-in or holding your business card, they should have the same visual experience over and over again. 1. You will be taken seriously. If you look consistent and legitimate, then you will look more professional. And, the more professional that you look, the more that people will view you as an expert, like you, trust you and hire you. Plain and simple. 2. You will be memorable. The more that you show up consistently, the more that your potential clients will start to recognize you — over and over again. People like familiarity and to be connected to something that they feel they’ve known forever. Which leads me to #3. 3. You will be trusted. You’ve probably heard business coaches and thought leaders mention the “know, like, trust” factor. Well, it’s definitely a very real thing. When it comes to potential customers, they first have to get to know you. Once they know you and see what you’re about/represent, they begin to truly like you. Finally, once they like you, the more likely they are to trust you. And once you have that trust, you have the start of a beautiful business relationship — and they will most likely end up hiring you. 4. Your mission and vision will be stronger. I always say that even before design and visuals come into play, you need to determine the mission/vision of your business — it’s one of the first and most important parts of branding. You need to know who you are, what you do and who you serve. Who is your niche market? What do you want to become known for? Once these components are solidified, you will find that your overall identity looks so much more professional, because you know exactly who you are. 5. You will be unique. Professional branding will set you apart and help you to stand out from the crowd. In this saturated world of online business, there are a million other people who do exactly what you do — they have similar websites, offer similar services and more. So, why should someone choose you over someone else? How can you position yourself, your messaging, your website and your services differently? 6. You will gain a following. This goes back to #1. The more consistent that you show up where your potential customers are hanging out and the more legitimate that you look — the more that people, in turn, will take you seriously. If you position yourself as an expert, speak to people’s pain points and offer a lot of value (especially if it’s free) people will like, trust and follow you more and more. Once you have a following (like a solid email list, weekly blog readers or Facebook group members) you will have more people interested in what you have to offer and who will more than likely buy from you, whether it’s now or in the future. 7. You will emotionally connect with your clients/customers. To add to the idea of having a following and offering a lot of free value to them connects to this point and the “know, like, trust” factor. Again, once people like you enough, they will connect with you on a deeper level because they know that you can help them. Instead of just being someone that they see pop in Facebook groups from time to time or someone who offered them a downloadable freebie once (like everyone else) you will be someone who they regularly seek out and trust. Once someone sees that you can help better their business, they will more likely want to work with you. But, not as many will want to if they don’t feel like you are an expert who can help them. So, make sure that you not only ARE the part, but LOOK the part, too. QUICK TIP: Should your brand fonts be separate from those used in your logo? I was talking to a design friend from college the other day that was getting ready to design some new print materials for a client. While the client’s logo (that she did not design) had a decent color palette and “OK” visual elements to it, the fonts were certainly dated and the weakest aspects of the design. In developing the new pieces, my friend asked me if I thought she should come up with some new brand fonts for them, as the client wanted a new and fresh look anyway. After some conversation, weighing the pros and cons, we both ultimately agreed that she should come up with new ones to use in her design. Whether you are asked to develop new typography for a brand entirely (doesn’t matter if you’ve designed the logo or not) or at least for a special project, this is something really important to consider. Frankly, there is no right or wrong answer. A lot of variables can play into whether or not a brand should have a set collection of “brand fonts” used on print and digital materials that are separate from ones that are used in a brand’s logo. Overall, it all depends on the strength of the logo fonts. Sometimes, a logo uses a unique, decorative or hand-drawn typeface in an artistic way and other times, a logo uses classic typography choices in a straightforward, simple and clean design. So, at the end of the day, should your brand fonts be separate from those used in your logo? 1. No, if the logo already uses a good serif + sans serif combo. When I design a logo, I tend to use a combination of two fonts. This might be a serif and sans serif combo or a handwritten + sans serif combo. I tend to make the name of the business the main focus of course, on its own line — and I’ll run a tagline or small description (if needed) underneath that. Regardless, whether I’m working with a logo that I’ve designed or that someone else has, if there is a nice combination of fonts already being used that express the brand well and that I know will be professional and readable across different mediums, I will usually just stick with using them as the “official” brand fonts. You certainly don’t have to, but I don’t see a big reason not to. To learn the difference between the three main styles of fonts, feel free to reference this past blog post. 2. Yes, if the logo is dated and you can’t change it right now. Like my friend that I just mentioned above, if you’re working with a logo designed by someone else and the brand doesn’t plan to update it anytime soon, you need to decide how you feel about the fonts used in the logo. If they’re dated or too decorative/artistic to use consistently, over and over again on branded materials, then you should recommend a good pairing of fonts that will complement the existing design. This is what my friend and I decided that she should do. You can still respect the existing logo and brand elements, but if you’re not able to offer an entire rebrand, you should at least still offer your thoughts on some fresh typography that can be used to help enhance the current brand. I got a question for ya. How is your branding looking? Would you like to revamp it for 2018? Do you have a logo, website and more that you absolutely love…or…not so much? If you’re not a design professional, branding might be something that you don’t love to do for your business or you simply don’t have time for, so let someone else take over! Sign-up below to receive the link to download my new and free PDF tool “Branding 101: What it is, what it isn’t and why you need it” — right now! This quick and simple guide will walk you through why it’s important to establish consistent and memorable branding within your biz — and if you can DIY some of it or if you should hire that professional. If you have any questions after going through it, let’s connect and chat some more! 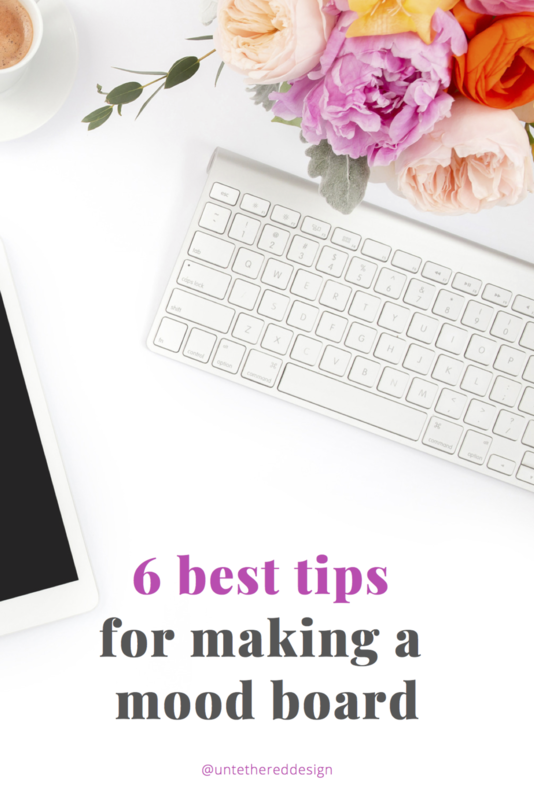 While we really know that setting ourselves (and our businesses) up for success still takes a lot of time and hard work — nothing is as easy as it seems or is advertised — I’ve got a few quick tips for you to follow today, that will most definitely improve your current branding. Can you say that you’ve done all four of the following? Ask yourself now…and you will learn a little more about your biz and what you need to keep working on. And, go! If you know who you are, what you enjoy doing and can sell what someone needs directly to them; you can have a very successful business. But, in order to look professional, you have to play the part. If you don’t have a strong logo, website, social media graphics, marketing materials and messaging in place, you will not be taken seriously by your clients. The more consistent you are with all of the aspects of your branding matching and flowing together cohesively — and your content is delivered in a complementary way with the branding — you will look more sophisticated and legitimate. Your branding is a reflection of your personality, your style and how you serve your clients. If your visuals connect with your words and they communicate well together, your brand will be expressed more effectively and resonate better with your clients. It’s hard to believe that we are nearing the end of another business year! Are you ready for 2018? Do you have a logo, website and more that you absolutely love…or…not so much? If you’re not a design professional, branding might be something that you don’t love to do for your business or you simply don’t have time for, so let someone else take over! Sign-up below to receive the link to download my new and free PDF tool “Branding 101: What it is, what it isn’t and why you need it” — right now! 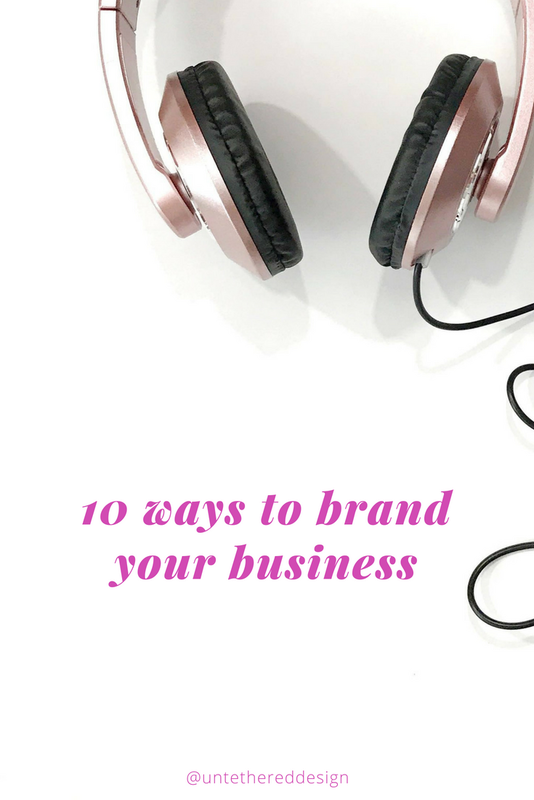 This quick and simple guide will walk you through why it’s important to establish consistent and memorable branding within your biz — and if you can DIY some of it or if you should hire that professional. If you have any questions after going through it, let’s connect and chat some more! I was talking to a friend just last week who is getting ready to launch her new business. We were talking about branding and how she wants it to look “high premium” because her services won’t be cheap. I told her: “like attracts like.” Have you ever heard of that phrase? Probably so. We are what we attract — what we put out into the universe is often what we get back. In running a business and developing the visual side of its brand, it’s important to remember that not everyone is supposed to be or will be your ideal client. You need to have a niche market/target demographic/specific style that you serve, so that you only attract and serve those types of people. If you offer a service or sell a product with a fancy steakhouse price tag, you don’t want to attract someone who is only looking to buy a cheeseburger at McDonald’s and not spend more than $5. The more that your values align with your client’s, the more that they understand that what you have to offer is worth every penny and the more that you will attract the right kinds of buyers. The money won’t matter — they will believe in and need so much of what you can give them, that they won’t bat an eyelash at the price. And, they will happily refer you to other (hopefully) like-minded folks needing the same things. 1. You will look more professional. Not only will you look the part of an expert, prospective clients will also look at you in the same way. When you have professional branding in place and look just a little “fancy” — you will also attract others who are sophisticated. If I am seeking a certain professional to work with, whether it’s a copywriter, business coach, etc., I’m going to look at their logo, website, social media, the way they speak, the way they write, the type of content that they put out and more. If everything is really sleek and professional and I genuinely connect with and like what I see, I’m going to reach out to chat with them about what they can do for me. If their branding isn’t cohesive, they don’t show consistency in any ways, they seem scattered or don’t speak or appear confident, they’re not going to impress me for a second and I will pass. 2. You will feel more professional. Plain and simple, when you LOOK more professional, you FEEL more professional. Many of us “work from home” entrepreneurs are definitely in tank tops and yoga pants most days, but when we do get dressed up, have our makeup on and hair done, don’t we just automatically walk with a little extra pep in our step? I know that I do. I feel better about myself and the confidence shows. It does for anyone! When you have a logo, website, photography and content that you’re proud of and want to show off to the world, people will see the pride and joy that you take in your work. 3. The right people will trust and believe in you. If you look high premium, feel high premium and have high premium prices to match, you will attract high-premium clients. This is because people who trust what you’re saying, doing and have to offer them (and believe in your brand) will buy from you without questioning it. They realize and see the importance in what you offer and that it will benefit them. They will pay you what you want and on time, because you would do the same if you were investing in a service to scale and grow your business, right? I have come to find that when I immediately connect with a prospective client, they like everything that I’m saying and agree with it, I don’t even have to work at the actual sale of my services. The conversation and process is fun and effortless. They already like me, trust me and know that I can do a great job for them. Then, when I say the cost and that I require a 50% deposit to begin the work and the final 50% due at completion of the project, they say: “Send me the contract and invoice!” Not every client is perfect and like this every time, but the more that you exude professionalism, class, expert thoughts/content, strong visuals and more (thanks to great branding) — the more likely that you will attract the same back. The time has come. You’re ready to hire a designer to create your logo! Perhaps you are starting a new business from scratch and you realize the importance of investing in professional branding. Or, maybe you’ve been using a logo that you DIY’d a couple of years back and it’s time for a makeover. Either way, this is a big step in helping to establish your visual brand and create a face and icon for your business that people will come to know, recognize and trust. It’s a big deal! I design logos regularly. I book at least 2-3 logo packages a month, so I’m always meeting business owners who are excited to establish their professional “mark.” I have a certain process when it comes to working with someone — from the questions that I ask, to the number of concepts and revisions that I take care of, to how I deliver the final files. Most of the time, my clients and projects are very enjoyable and the process has smooth sailing. However, every once in a while, I hit a wall where a client doesn’t always know what they want or need. Now, I understand that they’ve hired me because I am the expert. However, when working with a designer, there are just few and simple things to consider and prepare for. You need to have some clarity on your end, in order to help your designer develop the best result for you — because it will allow their job and vision for you to be executed much easier and that’s a win-win for both sides! 1. Create a Pinterest board with inspiration that you like. Pulling inspiration from Pinterest images is a great way to put together possible ideas for the direction that you want to take your logo. The same can be applied when it comes to color palettes, below. You can create mood boards with color swatches, patterns, textures and photos that represent the different shades and hues that you like. You can also create boards of other logos, designs and typography that you are attracted to. This isn’t intended for your designer to copy, it’s just to serve as an idea generator and for them to get a feel for the style that you want. 2. Although color can come later, still think about palettes. I had an amazing client once who ultimately realized that the color palettes she thought of considering for her new brand were ones that she liked in her home, but not for her business. And, that was a great consideration! It even helped me to remember that just because you like to decorate with or wear certain colors, you might like something totally different in your professional life. Although some designers will present concepts in black and white, so that the focus can be on the design (which is important) — it’s still important to consider colors for the sake of what emotions they evoke. What look and feel are you going for? What do you want people to remember your business for? If you need help with putting together some combinations, check out this blog post on color theory. 3. Be clear on your direction, strategy, mission and values. I saved this for last, but it’s the biggest and most important one. Sometimes, I might have a client come to me, excited about getting a logo designed. And, that’s wonderful! However, when you’re not 100% set on your brand in general – what you do, who you are, what you represent, what you want to be known for and why people should trust and hire you – it makes it difficult to establish an identity to represent it. There are things that should come first, before you start creating visuals. Do you have a business plan, mission statement, values, content and strategy in place or at least prepared for the most part? When these aspects are confirmed and you’re really clear on each one, a designer will be able to create an expression that brings your overall vision to life much easier! If you need to work with a brand strategist first to help you with those important items, definitely do so before working with a designer. Don’t put the cart before the horse. It’s sometimes easy to forget that your brand is more than just your logo. It’s more than the way that your website looks and functions, it’s more than the feel of your business card in your hand. It’s more than the words that you say, the strategy that you stand behind and the stories that you tell. It’s more than just the vision that you have for yourself (and your visuals.) It’s ALL of those things. All of them working together, as a team, to give you an overall and cohesive identity — one that your clients remember and makes them feel something. Your brand isn’t just an identity, though, either — it’s an expression. 1. Your brand is an experience. Your clients (and prospects) should have the same experience every single time that they come into contact with it. All of your materials, tangible and non-tangible, print and digital, in-person and online — should be cohesive and consistent. Whether someone looks at your business card, browses your website, reads your social media posts or the content that you put out, meets with you via video conference or over a coffee chat, etc., they should know that it’s you, each time. They should feel something and be able to see how genuine and authentic you are and what value you bring to the table, with the services that you provide. 2. Your brand reflects what others think of you. If your brand is professional, legitimate and polished, people will feel the same way about it (and you.) They will take you seriously and more confidently hire you, if they truly like and trust you. If they are digging what you’re about, who you are, what you offer and see that you can serve them (all with the help of the different aspects of your brand that they experience, see point #1 above) — they will undoubtedly want to work with you. I want to hire someone that I feel is not only professional, talented and experienced — but who I can also relate to. As humans, I’m sure that most of us feel that way, as well. 3. Your brand includes your vision, mission, strategy and content — not just design. These “non-visual” elements should come first, even before design and your logo is created. When you get super clear on who you are, what you do, what you want to be known for, who you want to serve and how you’re going to serve them, it will be much easier to decide on things like color palettes, typography, style elements, website function/development, printed/in-hand materials, social media platforms and more. When you have brand clarity, by knowing yourself and your craft really well and the words, strategies and systems that will attract paying clients in place, the “fun and pretty” aspects of your brand will come to life more quickly because they will simply complement and express the other aspects that you’ve already established. Here we are, 2017! How is your branding looking for the new year? Do you have a logo, website and more that you absolutely love…or…not so much? If you’re not a design professional, branding might be something that you don’t love to do for your business or you simply don’t have time for, so let someone else take over! Sign-up below to receive the link to download my new and free PDF tool “Branding 101: What it is, what it isn’t and why you need it” — right now! This quick and simple guide will walk you through why it’s important to establish consistent and memorable branding within your biz — and if you can DIY some of it or if you should hire that professional. If you have any questions after going through it, let’s connect and chat some more! Have you ever wondered why some brands are so iconic? Known and recognized by literally anyone in the world — appearing in some form everywhere you turn? What makes them so special, so striking, so engaging? Why do they attract so many people from their ideal client base? You know the ones I’m talking about — the golden arch of Mickey Dee’s, the green color palette of Starbucks, that simple but now forever famous “swoosh.” Why is that we only need to see a simple shape, read a slogan, hear a jingle or see a distinct color to know exactly what we’re looking at? Good and successful brands give people an experience. I’m not just talking about a fun logo, interactive website or a sign that you see in the sky. While those are all elements of the brand, too, I’m talking about the tangible and sensory-related things that stimulate us, every time we come into contact with the brand. Over and over and over again. No matter which McDonald’s you go to in the U.S., you’re going to have the same overall brand experience. The menu, the smell of their food, the layout of the restaurant and more. The same goes for Starbucks – your drink of choice (should) most likely always taste the same. The store should smell the same, the employees are dressed the same and again, the menu is the same. It took years, premium marketing and endless creative strategies to make these experiences happen and continue to happen, but that’s what makes for a successful brand. It takes time, thoughtful investments and energy. Although most of us entrepreneurs are not Fortune 500 company owners and we might not even have a staff at all, we can still follow similar practices of the big brands, to help get our messages and what we’re about out into the world — so that our reputation and client base can grow. 1) It’s customized, unique and stands out in a crowd. This is kind of a no-brainer. With so many entrepreneurs running the same types of businesses in the online world today, it’s crucial and a must that you stand out. Not that you need to worry about competition, but you need to be authentic, real and genuine. Your visual identity, messaging, strategies and everything about your brand should encompass and reflect who you are. Your personality should shine through and attract people within moments of coming into contact with your brand. Being memorable is an extension of being unique and standing out. You want people to experience something that they’ll only experience when dealing with you. And, you want people to either keep coming back to you after they’ve worked with you or remember you enough to use when they are ready to hire. 3) It’s relatable and visually pleasing. People connect with things that they know and like. Obviously, someone who is your ideal client/right fit will enjoy their brand experience with you, if you can make them feel good and deliver on what they need. People relate to people and they’re instantly attracted to strong imagery and compelling copy. If you have an identity that is approachable, inviting and attractive, they will more than likely want to keep experiencing you — whether it’s through reading your blog posts, downloading a freebie or scheduling a consult to actually talk to you about you can offer them. 4) It can be seamlessly transitioned across a variety of platforms. So many elements play into this. Whether it’s your collection of fonts, color palette, logo or website, everything needs to be consistent and cohesive. And, these elements should all work together well. If you pull the website up on a desktop, it should still look responsive and be mobile-friendly when viewed on a smaller device. Your logo should be visible and readable whether it’s on a billboard, t-shirt, website, tote bag or coffee mug. Shapes, elements and the overall look and feel of every single one of your materials, whether printed or digital, should be translatable across all mediums and platforms. 5) It will last for a long time and not quickly look dated. This last point is KEY. Design changes constantly. What’s “in” now, might not be popular next year. Graphic design is a lot like fashion design in that way. Trends come and go. Keep this in mind whether you’re designing or hiring a designer to handle all of your branding. Develop visuals that will be able to hang for a while. That way, even five years from now, your identity will still look relevant, modern, legitimate and therefore, professional. You want to still be taken seriously and not have a logo that looks like it was created in 2000.